Albert Raper "A.R." Beardsley and his wife, Elizabeth Baldwin Beardsley, picture taken circa 1872, the time of their marriage. 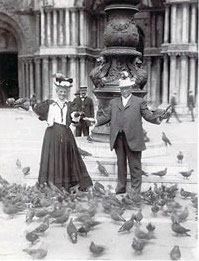 Albert and Elizabeth Beardsley at a lighter moment in Venice during one of their many trips to Italy. 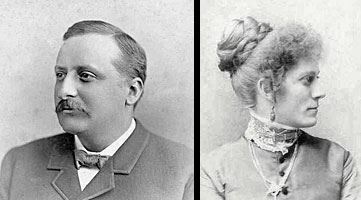 Albert Raper (1847-1924) and Elizabeth Baldwin Beardsley (1850-1924) were among the leading citizens of Elkhart, Indiana, at the turn of the 20th century. The couple's only child, Ruth, was born in 1880 and died in infancy. Ruthmere was named after her. "Mere" was added to "Ruth" to suggest "near the water" as Ruthmere was built at the confluence of the St. Joseph River and the Elkhart River. Ruthmere was a center for business, family, political, and social gatherings until Elizabeth and Albert died in 1924. At that time Arthur L. Beardsley, Albert's nephew and a Miles executive, and his wife Stella moved into the home. A. R. Beardsley was the nephew of Dr. Havilah Beardsley, the founder of the city of Elkhart. At age 14, A.R. moved to Elkhart from Dayton, Ohio, to live with Havilah's widow, Rachel. He worked as a clerk in an Elkhart dry goods store, and by 1870, he was able to buy it. As his business acumen increased, he purchased the Muzzy Starch Company in Elkhart in 1878, and later became president of seven starch companies. He had become one of Elkhart's most important businessmen. A.R. joined the Dr. 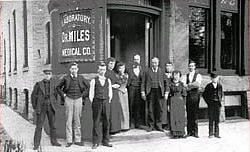 Miles Medical Company (later Miles Laboratories) in 1889 and contributed greatly to its development and growth. Beardsley became general manager in 1890 and retained this position until his death. His business expertise, along with that of several relatives who joined the company, helped Miles Laboratories become a major force in the emerging 20th century field of over-the-counter medical products. Two early products, Nervine and Dr. Miles' Restorative Tonic , were followed by the more familiar Alka-Seltzer® , ONE-A-DAY VITAMINS® , and Bactine®. Miles grew into an international leader in over-the-counter remedies as well as diagnostics. Today, the familiar Miles Laboratories products continue to be made by the Bayer Corporation which purchased Miles in the 1980s. Albert R. Beardsley was also active in local and state politics. After holding several local offices, he was elected Indiana state representative in 1899, and in 1905 and 1907, was elected to the state senate. A.R. Beardsley passed away on July 15, 1924, just five months after the death of his wife Elizabeth. Elizabeth Beardsley was the daughter of Silas Baldwin, another Elkhart pioneer. Elizabeth was known for her many charitable and civic activities. As Elkhart's "Flag Lady," she donated flags to local schools, fire departments and other organizations. 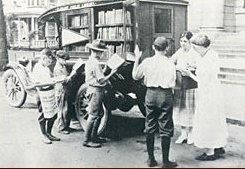 She was on the Elkhart Library Board of Trustees, and had a hand in donating the city's first bookmobile. Elizabeth was also active in the League of Women voters. In fact, the Beardsley's first home together was donated to the League when they moved into Ruthmere, and later became the meeting place for a local women's arts organization, The Four Arts Club. She was something of an iconoclast for her time. It is reported that she wore makeup when other women did not, and she was known to smoke and swear when the spirit moved her. She also drank a split of champagne every night before bed (on her doctor's advice, of course) to help her sleep better. At Ruthmere, Elizabeth often hosted get-togethers for local women, including employees of Miles Medical. At many of these gatherings, she would talk about her travels to Europe with A.R. She passed away on March 7, 1924, of complications from diabetes. 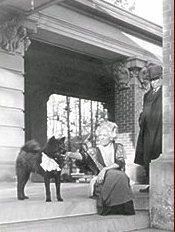 Elizabeth on the piazza with one of her dogs. A.R. is watching in sight.